Jordan Peele, Tim Burton, Woody Allen, Ridley Scott, and Racism in Casting - Truth or Fiction? 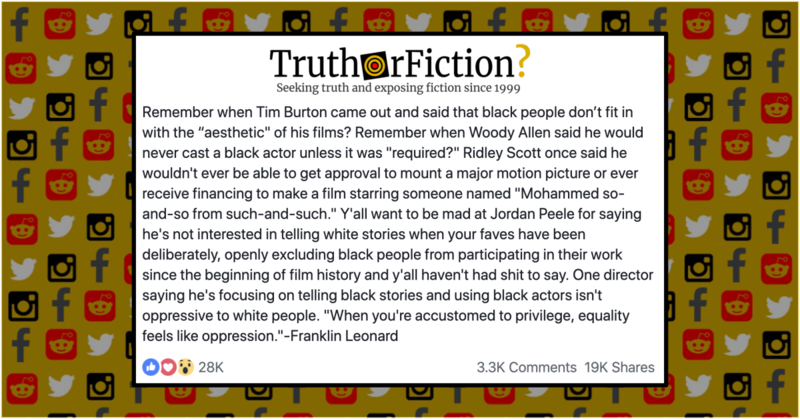 A viral Facebook post makes claims about casting and ethnicity about Jordan Peele, Tim Burton, Ridley Scott, and Woody Allen. In relation to Jordan Peele's casting of people of color, a Twitter user claimed Tim Burton, Woody Allen, and Ridley Scott asserted their reticence to cast black actors. Peele’s comments predictably generated complaints, which the original poster addressed by referencing purported comments made by Tim Burton, Woody Allen, and Ridley Scott, such as a claim that Tim Burton once said that black people do not match the “aesthetic” of his films. For fans of Ransom Riggs’ 2011 bestseller Miss Peregrine’s Home for Peculiar Children, one of the things that made the news of its big-screen adaptation so intriguing was imagining which actors would make up the ensemble. The book features a large cast of characters, from the eponymous children to the many adults who throw them into peril. The idea of seeing them portrayed on-screen thrilled readers of Riggs’ book hoping to see a diverse group of actors take on the challenge. Yet in reality, the few dozen characters that make up the movie version of Miss Peregrine’s are predominantly white, with Samuel L. Jackson’s Barron being the only notable exception. Sitting down at New York’s McKittrick Hotel to discuss the film, director Tim Burton tells me why that’s the case. The “aesthetic” comment was a characterization made by the Washington Post, but in the original interview Burton said “things either call for things, or they don’t” about the lack of diversity in his films. The director did acknowledge and address the casting decisions made in his films, particularly how they related to race. A post on Facebook defended Peele’s affirmative decision to cast black actors in his films by quoting Tim Burton, Woody Allen, and Ridley Scott in their responses to claims that they chose predominantly white actors for roles in their films. Burton decried “forced diversity” in his 2016 comments, Allen said he’d cast black actors if he writes a story that “requires” black actors, and Scott said he chose white actors for non-white roles because he feared inability to finance projects otherwise. Those comments were largely presented in an accurate fashion, although the conclusion fell partly in the realm of opinion.